Some of the best memories of my childhood revolve around my maternal grandmother, who lived in Texas. She was loving and gentle and generous. Always smiling, she worked from dawn til late each night cooking and cleaning for her family. My cousins and I were the focus of her affection and attention whenever we visited her. Having lived through the Great Depression, my grandmother was frugal and thrifty in a way that few of us are these days. She never discarded anything and if something broke, she fixed it rather than replacing it. After she died, we sorted through her closets and found boxes filled with her “salvaged” treasures. At the time, we thought it was funny that she’d held on to what we considered to be junk. Now, more than 35 years later, I appreciate that trait of hers a great deal. She could have invented the “reduce, re-use, recycle” campaign. There’s something to be said for fixing broken things. After all, we’re each one of us broken in one way or another, or even in a dozen ways. We live in a fallen world, a world that is at once incredibly beautiful and heartbreakingly wounded. Sort of like you and me. Our Creator loved us enough to become one of us so that He could be our way out of the darkness of sin. In this first week of Advent, we’re looking forward to the coming of that Light. And so Advent is a good time to examine our broken places, because it is our sins that He cam to heal. What in my own heart cries out for that healing? What relationship in my life is most broken? Who have I sinned against? What parts of my soul do I withhold from The Lord? What part of me do I hide from His Light? In Advent, we prepare ourselves for the coming of Emmanuel, “God with us.” It’s a time of prayer and reflection, of hopeful waiting, of self-examination. We can ask God to help us see ourselves honestly and to lead us to repent of our sins. 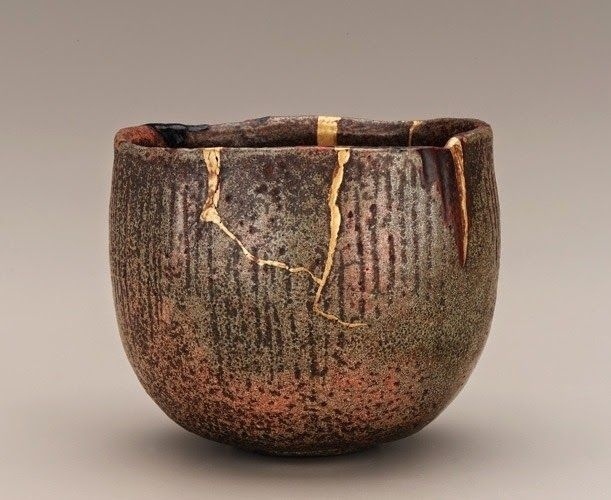 In confession, God’s mercy is like the process of Kintsugi. We ask for His healing and we commit to turning away from our sins. His love is the gold that transforms our wounds into His glory. God finds treasure in our willingness to humbly ask for His mercy and healing. He is a God of paradox, after all. The Creator-King Who comes to us as a penniless, powerless baby in a manger; the Nazarene carpenter Whose death opened the doors of Heaven. He is the Lamb of God, born to be slain so that you and I can, like St. Paul, ask: “Where, O death, is your victory? Where, O death, is your sting?” (I Cor. 15:55-57). When we lose ourselves, we find Him. When we decrease, He can increase (John 3:30). This Advent, let the Lord embrace your wounds and heal them with His mercy and love. Before you dress the tree in silver and gold, remember the broken cup and the golden repair that transforms it into a treasure. You aren’t something to be thrown away—you are a beloved child of God. Allow His grace to make you whole. All of us long to know God. It’s been said that there is a God-shaped hole in the hearts of men. I believe that’s true. We seek Him out — in His scripture, in His Church, in the beauty of creation, and in one another. And if we truly and humbly search for God, He never disappoints us. Lately, I’ve been reading about people who claim to have encountered God in their dreams, in visions, and through His angels. This can be a confusing journey full of hazards and dead-ends. Thankfully I’m blessed to have guidance along my way in the teaching authority of the Catholic Church. The Church teaches (and has taught for many centuries) that the public revelation of God ceased upon the death of St. John, the last living Apostle. Jesus Christ was and is the complete and total revelation of the living God. Nothing can “add to” to the Word of God in His beloved Son. As the Catechism states,”….no new public revelation is to be expected before the glorious manifestation of our Lord Jesus Christ”(paragraph 66). So do Catholics believe that God no longer reveals Himself to us? Of course not. We come to know God throughout our lives in and through our prayerful participation in the Church He left for us. We enter into His family at Baptism. We encounter the grace of His mercy in Confession. No more intimate knowledge and experience of Christ exists than in our communion with Him in the Most Blessed Sacrament of the Eucharist. Our Confirmation infuses us with the gifts and guidance of the Holy Spirit. God reveals Himself to us in our reading of Sacred scripture and in our prayer life which is a true fount of His love and grace. The Holy Spirit inspires and teaches us in the Sacred Tradition of His Church. God is always reaching out to us and pulling us closer to His Sacred Heart. 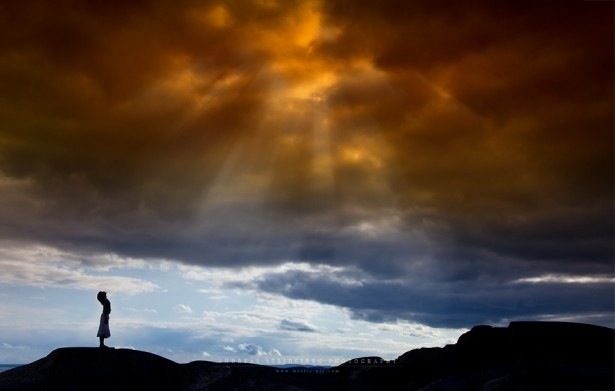 Throughout the centuries, people have claimed to have received private revelations from God. From the very first years after Christ’s Ascension, the early Church fathers taught that private revelation should always be approached with great prudence. Men like Polycarp, Justin Martyr, Irenaeus and Augustine all taught about the proper limits of private “knowledge” of God that persons might claim to have received in dreams or visions. And yet the Church has always been open to the workings of God in the lives of His children. “Do not quench the Spirit. Do not despise prophetic utterances. Test everything; retain what is good”(I Thess. 5:19-21). The testing and retaining is part of the authority that Christ gave to His Church and so this process is rightfully one left to the pope and bishops. St. John spoke of this authority: “We belong to God, and anyone who knows God listens to us, while anyone who doesn’t belong to God refuses to hear us. This is how we know the spirit of truth and the spirit of deceit” (I John 4:6). Catholics believe in miracles and our Church is open to them. At the same time, any true mystic or visionary will readily submit themselves to the investigation and scrutiny of Christ’s Church because the Church acts with His authority. She is, after all, His spotless Bride. Private revelation is never necessary for salvation. A person’s visions or writings can never “correct” or surpass the revelation of Jesus Christ. If anyone claims otherwise, he or she is in error, even if their “revelation” gains a large and popular following. We see this everywhere today. In the final analysis, either there is a Church whose authority was given it by God, or there is not. If there’s not, then anything goes and your religion is just as valid as anyone else’s religion. From the writings of Mohammed and Joseph Smith, to all the new-age mystics and seers and prophets, we have more than 33.000 different religious denominations on the planet today. Someone has a vision or a “word of knowledge” and the next thing, they start their own church. We have splintered the Body of Christ by rejecting the authority He gave to St. Peter and his successors. Surely God weeps that His family is so estranged from one another. If we are followers of Christ, we must pray and work together to come back under the same tent, to kneel together at the same altar and to profess our faith in the one, true God, our Lord and Savior, Jesus Christ. This is the time of the year when the angels come out. They come out of storage boxes and craft tubs and ornament bins. And if you need more, they’re on sale everywhere you look. It’s the season of angels because angels are so closely associated with Christmas. The angel Gabriel appeared to Mary at the Annunciation and told her of God’s plan for the birth of our Savior. Another angel visited St. Joseph in a dream to reassure him about Mary’s pregnancy and their upcoming marriage. And of course on the night of Jesus’ birth, the skies were filled with angels who sang and celebrated the coming of Emmanuel and told the shepherds of the newborn in the manger. It’s no wonder that when we think of Christmas, we think of angels. But how accurate is our imagination? Are angels really those sweet, blonde-haired frilly-dressed young women with feathery wings that we set on our mantels or place on our Christmas trees? Uh. No. Angels are pure spirit and have no physical bodies. They are neither male nor female. They aren’t like us. Most of our ideas of angels come from religious art over the centuries. Because they’re so different from us, artists have had to use familiar ideas and themes to depict angels. How do you paint a pure spirit? The word “angel” means “messenger” and in Scripture angels deliver messages to us from God. So artists have shown them with wings. Often, angels would tell folks to not be afraid of them. This is understandable if an other-worldly being suddenly appears in front of you saying that they have a message for you from God Almighty. So artists have often “tamed” angels to be more human in size and dress. They were often depicted as glowing heavenly light and having haloes. It was the Victorian era that really sapped the power out of angels, giving us the soft, feminized angels we see in modern culture. Too bad for us, because angels are so much more than that. Catholics believe that each one of us has a guardian angel who was given to us by God before we were born. They remain at our sides throughout our lives and accompany us at the time of our death. They’re with us for protection and for guidance, but we have to ask them to help us. Like God, the angels respect our free will and they won’t force themselves on us if we don’t invite them. Each angel is a unique individual with great intelligence and free will of their own. Angels are immortal and powerful beyond our imagining. We don’t worship the angels or see them as some kind of “junior” God. We ask them to help and protect us and our loved ones, just like we ask the saints in heaven for their prayers and protection. Every angel has a name, but most are known only to God, Who created them. We know only about four by name: Michael, Gabriel, Raphael and…wait for it…Lucifer. Yep, remember that the devil is an angel who rejected God. He took a lot of other angels with him when God expelled them from heaven. Lucifer uses his free will to do evil. And he’s out to get us, if we allow him. But God is more powerful than all the agents of darkness. Nevertheless, remember that not all angels are good. 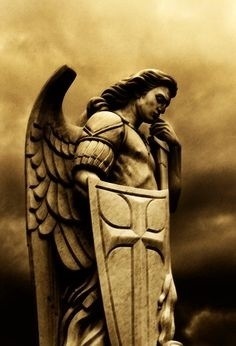 Our guardian angel is another layer of the armor of God, which He gives us to make our way in this fallen world. They were made by Jesus and through Jesus to help us to get to heaven, to resist the lure of this world and the dangers of hell. They are our fellow members of Christ’s Mystical Body, which is His Church. They worship God around His altar in heaven and visit our altars as we celebrate the Holy Mass on earth. At this very moment, the angels are dancing around God’s throne in heaven. They love God completely. Why would anyone NOT want to include their guardian angel in their daily prayers and devotions? As for me, I don’t imagine my angel as a frilly Victorian lady with blonde curls. I’m pretty sure mine is more like a Navy SEAL, in full combat gear, locked and loaded for battle. Thanks be to God! Our parish church is a beautiful and imposing structure. The current building was constructed in 1890 and is listed on the National Register of Historic Places. 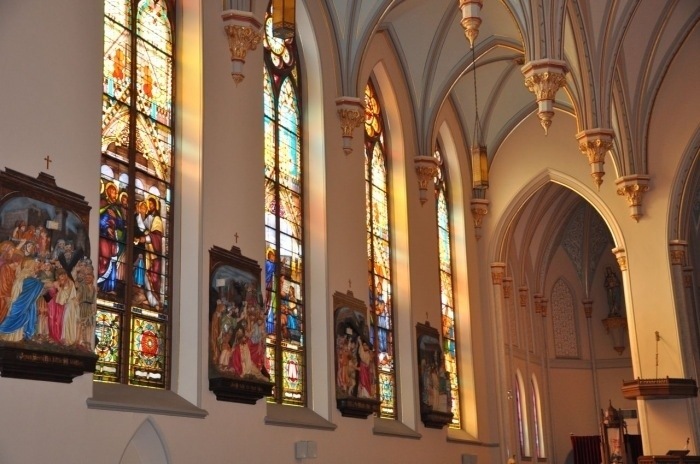 For me, the most striking feature is the array of incredible stained glass windows flanking the nave and the rose window behind the choir loft. They were designed by Louis Comfort Tiffany and and are truly breathtaking. Sitting in their multi-colored glow at morning Mass is a foretaste of heaven. Several years ago the windows were cleaned as part of a renovation project and protective coverings were put over them on the exterior. The coverings don’t affect the view from the inside of the church at all. They let in all the sunlight just like before. The coverings protect the priceless windows from harm. But seen from the exterior, the coverings completely obscure the beauty of the stained glass. If you’re on the outside of the church, the windows look like plain, gray glass. It’s as if the beauty of the glass was made only for the people inside. Sometimes it’s easy for a parish to become too focused on its members and to forget the greater community. We may have lots of active ministries, but how many of them serve the folks outside our doors? Think of the proverbial church supper. Yes, there’s a need for fellowship and breaking bread with our faith family. It’s important. But do we fill our own stomachs while there are people in our neighborhood who don’t know where their next meal is coming from? Sometimes we cook our favorite dishes to impress one another and we forget to feed the hungry among us. Look at your church calendar for the past year. How many activities served the people in your pews? Look at your parish budget. What percentage of your funds go to serve the community, to spread the good news of the Gospel and to bring others to Christ? Do we encourage parishioners to serve others outside of our own parish ministries? Or are we protective of their volunteering, wanting all their time and talent for our own use? Do we invite community organizations to speak at any of those church suppers in order to gain support from our members? 1) Servants forget themselves. They do what they do in order to give glory to God and not to gain attention or notice for themselves. We don’t seek applause for our efforts. We don’t clap for ourselves on Sunday morning. Jesus poured out His life for others. Our parish has to do the same. 2) We have to think and act like stewards and not like owners. We can’t get possessive about finances or ministries or programs or anything else. None of it—none of it, belongs to us. 3) Our children have to see that serving Christ means serving others. Kids can equate “church” with “going to Mass” and too often they stop going when they leave for college. Mass is crucial, yes. But “church” is a verb and it means serving others, helping those in need, and talking to others about Jesus. Our kids need to see us doing that. 4) Paying others to serve the poor in our place isn’t enough. Yes, giving to charity and in support of our parish is important and we’re called by God to do just that. But servants do more than write checks. They serve, and with their children at their sides. 5) Our parish must be available to the community if we’re going to serve them. Our church doors and offices have to be open as much as possible. Strangers must feel welcome to come to us and share their needs. And we have to help them if we can. 6) A servant parish is a grateful parish. God blesses us to have a pastor, a building and group of believers with whom to gather around His altar. Gratitude is lived out in service to one another. Neither our hearts nor our parishes can have a “do not disturb” sign on them. When we’re truly grateful, we can’t focus inside our walls, and we don’t want to. So while our beautiful stained glass windows can only been seen from the inside, the light of Christ must illuminate our parish neighborhood. Gratitude and service to others make us stewards of our great faith. The love of Christ is too great a treasure to be contained by a building, no matter how beautiful it may be. We’re entering into the season of holidays and parties, of get-togethers and dinners. As we snack through our leftover Halloween candy, many of us are already planning our Thanksgiving feasts. It seems the most natural thing in the world to share food with those we love. Even if our family meals come pre-loaded with memories of past hurts or the anxiety of differing politics or lifestyles sitting down together at one table. Sharing a meal is fundamental to our human celebrations and remembrances. It’s no wonder that our most intimate expression of our faith in Jesus Christ is shared at His altar, in His Body and Blood—the Holy Eucharist. This isn’t something invented by the Catholic Church, but is exactly what Christ instructed us to do at the Last Supper (Luke 22:19). Jesus taught so much of His love for us at mealtimes. The images in His parables were often of food or were food-related. We hear of wine and wineskins, of wheat and figs and vines and gardens. He chose fishermen as His first Apostles. The Last Supper was itself a Passover meal, the sacred meal shared by Jews as a renewal of the covenant God gave to them out of His love. Just before the Last Supper, Jesus shared the Sermon on the Mount as He fed the 5000 with the multiplied loaves and fishes. The Gospel of Luke is full of instances where Jesus taught His followers at meals and through meal images. God always has a plan for us. His choice of covenant meals and food images is no more chance. From the very beginning God has been leading us to Holy Communion. Jesus was, after all, born in Bethlehem, which means “house of bread.” In the Eucharist,we are united to Him as a family. Passover was a foreshadowing of the Eucharist just as circumcision was a foreshadowing of Baptism In the New Covenant we enter into an intimate family relationship with God. Jehovah becomes Abba, or “Daddy.” Jesus is both our savior, our brother, and our sacrificial meal. St. Paul teaches about the Eucharist in his first letter to the church at Corinth. We hear of the “cup of blessing” (I Cor. 10:16) as the Blood of Christ and the broken bread as His Body. “Through the one Bread, we, though many, are one body: all of us who are partakers of the one Bread (I Cor. 10:17). Through the Eucharist we are united both to Jesus and to our fellow believers. This is the Good News. Our new covenant is revealed and worshiped in every Mass. For Catholics, the book of Revelation shows us the Mass in heaven. St. John and the Blessed Virgin Mary are worshipping with the angels at the wedding feast of the Lamb. Music and incense and a shared meal, in the very presence of the Holy Trinity offer us a glimpse of the world to come for believers. God’s plan for us is always one of drawing us closer to Him. The Old Covenant with Abraham made the Jews His family and set the stage for the coming of our Savior. In Jesus, we encounter the Living God, Who freely gave himself to the Father for our sins. He is our living sacrifice, offering His own Body and Blood as our nourishment and heavenly food. The upcoming holiday season is a time of family fellowship and shared meals. Will it also be a time of shared faith? Will you worship together with your loved ones? Will you share the importance of our faith with your family and friends? Will you take some time from your busy schedule to share your time and your bounty with the poor? Before you get too caught up in the blur of the next couple of months, remember all that you have to be grateful for and the reasons we’re gathering together to share meals and fellowship. Give to those who have less. Give thanks. Go to confessions and repent of your sins. Return to the Lord and be welcomed to His heavenly banquet. Only Christ can satisfy our hungry souls.